A question we get a lot when people roll into our shop is, “see that crack on my windshield? Do I need to replace the whole thing, or can I have it fixed?” Historically, any sort of damage would mean that a full replacement is necessary. However, numerous advancements in automotive technology have made it much easier to safely repair a damaged windshield. Here are some tips to help you decide what to do. Chips and small cracks are typically repaired by injecting an epoxy or acrylic adhesive that seals up the damage and makes your glass look new again. Chips smaller than a quarter, and cracks less than 3 inches long can usually be repaired. When considering having your windshield repaired, keep in mind that time is of the essence. A crack or chip represents a weak point in the glass, so the longer you wait, the more likely it is that the damage will get worse. Repairing a damaged windshield is much cheaper than replacing it, so it makes sense to have any small chips or cracks repaired as soon as possible. Repairs will often be covered by your insurance. 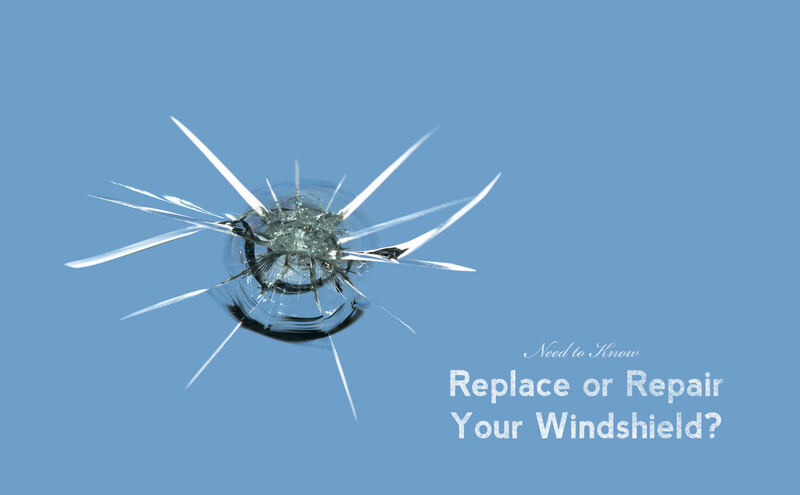 Replacing a windshield is a relatively simple process and is a requirement if your windshield can not be repaired. If your windshield was damaged in an accident, or the damage exceeds the limits described above, it is probably time for a full replacement. If you have been procrastinating getting your windshield replaced, remember that you can actually get a ticket for driving with an excessively damaged windshield. Windshield damage is considered to be a safety issue by most insurance companies, so they will typically cover the cost of the replacement. All you will need to pay is a small deductible. If you notice anything from a small chip to a big crack in your windshield, don’t hesitate. Send us a message, give us a call, or stop by and we can help sort you out.